VMware released the long-awaited vCloud API at VMworld 2010. The API is based on REST with 75 URLs defined in the user related part as you would find in the vCloud API Specification and vCloud API Programming Guide. I am an OO guy (I am sure many of you are as well), and find it difficult to go through the 75 URLs and numerous XML tags as either input or return. These URLs are like trees in a forest. But where is the forest? 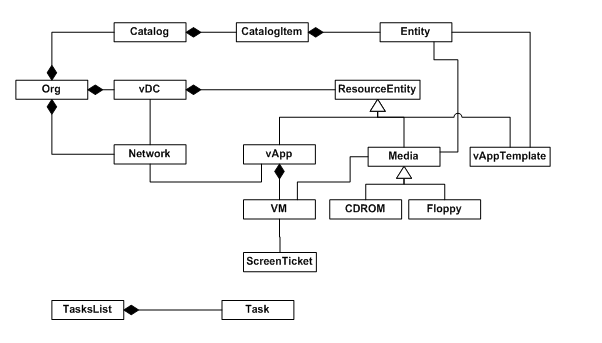 So I decided to create and show you a UML diagram (shown below) so that you can easily capture the key concepts of the vCloud API. In fact, there was a similar diagram in the programming guide of version 0.8. 1. get, which lists the content of an entity, and possibly its child entities. 2. modify or set, which changes the existing settings. Depending on the complexity of the entity, there may be multiple operations, each of which changes a section of the overall settings. 3. remove or delete, which destroys an existing entity. There are other operations, including power on and power off vApps, virtual machines, etc. But the above three types of operations represent more than half of the URLs. If you are interested to know more about REST and OO, you should read my previous blog: REST or SOAP.